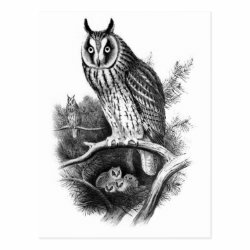 This is a vintage-style image of a Long-Eared Owl with an etched look. The adult bird is perched on a pine branch. Below the full-grown More... owl, four small owls cower in a nest within the tree. Another adult Long-eared Owl is perched in the background. This original vintage sketch of a Long-eared Owl makes a great gift idea for anyone that loves owls!